A truly major patch has arrived to StarCraft 2, focusing almost exclusively on versus changes, and boy is there a lot of them. 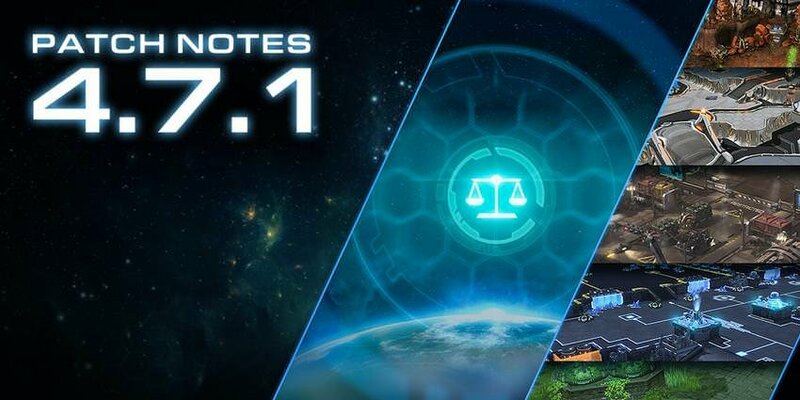 All three races get a ton of tweaks, with the biggest Terran changes coming to the Cyclone and the Battlecruiser now being able to move while shooting, while the Zerg get separate burrow and unburrow buttons and the Infestor gets a through looking at and the Protoss get almost their whole fleet tuned. There a gigantic balance patch coming to StarCraft 2 multiplayer later this year, affecting all races and focusing on late game power, unit composition variety, interesting upgrades and discouraging turtle play. The patch will arrive "soon" after BlizzCon, so somewhere in November, ad the design notes we got today are massive and contain detailed explanations on the tuning decisions. Drilling Claws upgrade now also permanently cloaks the Widow Mine while burrowed. A new visual effect will be applied to the Widow Mine to indicate this. This change restores the Widow Mine, post-upgrade, to its state prior to patch 4.0. This aligns with our previous goal of making early game Widow Mines feel fairer to both attacker and defender, while also improving the value of the Widow Mine upgrade. This should allow Terrans to utilize Widow Mines late-game more effectively in TvZ against Zergling/Baneling packs and achieve better passive scouting and zone control through well-placed mines. Base armor reduced from 1 to 0 Currently in TvT, Cyclones can trade very efficiently against most other early-game options. Removing 1 armor makes Reapers and Marines much stronger against Cyclones while not affecting Cyclone strength against units like Marauders and Siege Tanks. This should make them less effective to mass early on, but they’ll still have value if mixed with other units. Cyclone effectiveness versus Zerglings and Queens will also move in the Zerg player’s favor, so we’ll be watching closely. High-Capacity Fuel Tanks no longer increase the duration of Ignite Afterburners. Now it reduces the cooldown of Ignite Afterburners from 14 to 9. Medivac Heal will now work on units under the effect of the Phoenix Graviton Beam This keeps the uptime of Ignite Afterburners the same as before, but now players will have greater control over when they want to trigger it. Additionally, reducing cooldown makes it easier to move between multiple attack locations rather than having a longer duration, which encourages one-way attacks into a base. Overall, this should make the upgrade more attractive to players who value micro control for their Medivacs. Hyperflight Rotors upgrade cost reduced from 200/200 to 150/150 While speedy Banshees are very threatening, this upgrade is quite rare at high-level play. We wanted to give this Banshee upgrade a slight boost by reducing the price to make it more attractive to get in the mid or late game. Anti-Armor missile damage reduced from 15 to 0 Anti-Armor missile will now reduce Protoss shields as well as armor While we have reduced the Raven’s damage on the Anti-Armor Missile a few times now, it still sees use as a strong area-of-effect damage ability in the late-game during TvT matchups. Since the intent is for Anti-Armor missile to be used as a debuff and not for its damage, we want to emphasize this purity of purpose. Thus, we’re removing the damage and making it affect all types of armor upgrades in the game. Other changes might be required to make this spell sharper in its purpose, so we’ll be monitoring how things go during testing. Neosteel Frame and Structure Armor are being combined into Neosteel Armor, which combines their upgrades. It will cost 150/150 and take 100 seconds to research—the same as Structure Armor. Neosteel Frame improvements are often requested by various Neosteel enthusiasts in the community. This change aims to make it more attractive by combining it with an existing structure upgrade. Unburrow speed changed from 0.71 to 0.36 Unburrow random delay reduced from 0.36 to 0.08 Increasing Unburrow speed should allow for more tactical and sneaky Zerg plays—for example, using Hydralisks to catch Warp Prisms or Medivacs unaware as they fly towards a mineral line, or using Zerglings to ambush reinforcements as they walk across the map. Health decreased from 90 to 85 In the past, we set out to make the Hydralisk more of a core unit. This has perhaps been too successful, to the point where it crowds out other strategies. Altering the Hydralisks’ health reduces their ability to be massed by making them more vulnerable to area-of-effect damage. Since altering the health of core units is always a big change, we will be watching to make sure Zerg still has the Hydralisk as an option, although perhaps not the best option for every matchup. Infested Terran cast range increased from 7 to 8 At 8 range, Infestors will be better able to cast Infested Terrans outside the range of static defenses and further away from enemy armies, allowing them to more effectively break siege lines or threaten massed enemy forces. New upgrade added: Anabolic Synthesis Cost: 150 minerals/150 gas Research time: 79 seconds Ultralisk off-creep speed increased by 10% (4.13 to 4.55). On-creep speed is unaffected. Nydus Network cost increased from 150/200 to 200/250 Nydus Worm cost decreased from 100/100 to 50/50 While Nydus Worm is emerging, it will no longer be invincible. Instead, it has 6 armor. Burrow and Unburrow have been separated into two separate keys Burrowed and Unburrowed Zerg unit types will now be on the same tab-select, and both will be selected when double clicking on units This is a more experimental change. We have gotten requests over the years to separate the Burrow and Unburrow buttons for Zerg to give greater control over units, similar to how Terran controls the transforming of their Siege Tanks or Liberators. We are looking for feedback on how this feature feels in players’ hands, as it requires a bit of getting used to. Nexus Mass Recall renamed to Strategic Recall Mothership’s Strategic Recall renamed to Mass Recall Nexus Strategic Recall cooldown reduced from 130 second to 85 seconds Nexus Strategic Recall radius reduced from 6.5 to 2.5 We want to make Mass Recall a more useful tool for Protoss players to be able to attack early on with small groups of units without necessarily committing to an all-in attack. The greatly lowered radius makes it much less attractive for bringing back large armies, thus making positioning more important when moving with lots of units. Hallucination energy cost reduced from 100 to 75 Guardian Shield radius increased from 4 to 4.5 Currently, Protoss players often rely on Stargate units or Adepts to scout their opponents. Hallucination was more heavily used in the past, before Adepts existed, due to the opening phases of the game being faster and the window to build up energy on a Sentry being much lower. Therefore, decreasing the energy cost for Hallucination should help make it a more attractive scouting option. Feedback damage reduced from 1 per point of energy drained to 0.5 per point of energy drained When the Ghost’s Snipe ability was changed to Steady Shot, the Ghost lost the ability to instantly kill a High Templar, but Templars remained very lethal to Ghosts. This change should move this relationship to focus more on energy denial/casting rather than outright lethality. Reducing Feedback’s damage also means that Medivacs will also no longer be instantly destroyed, which promotes more multipronged play in late-game scenarios. Against Zerg, this makes Vipers slightly less fragile, which should allow Zerg a few more chances to try and pull apart a Protoss player’s late-game armies. Cost reduced from 200/100 to 150/100 Ideally, this change will reduce the strain on Robotics Facility unit build time. Currently, their cost and position in the Protoss tech tree makes it tricky to afford two of them early on, which is an issue since the four units it can produce are all very important to Protoss mid-game strategies. Since Robotics Facilities are sometimes used in proxy strategies, we will be monitoring this change to see if it makes holding proxies improbable. Purification Nova changed back to pre-4.0 state. Purification Nova deploys a ball of energy that will detonate after 2 seconds, dealing 155 damage and an additional 55 shield damage to all ground units in its radius. Purification Nova no longer detonates on contact with enemy units Purification Nova now sends a threat signal to the opponent on detonation instead of during the launch phase Last year, we made a change to the Disruptor to see if it could work better at chipping away at armies over time. The change created a new way to use Purification Nova, but the new Disruptor was less effective at dealing damage to backline units such as Lurkers, as the ability would detonate on melee units screening for them. In some ways, the Disruptor became harder to use, since the possibility of friendly fire was very high once combat with either Zealots or Zerglings was underway. For these reasons, we are reverting to the older version of the Disruptor. Graviton Catapult upgrade removed Hit Points and Shields increased from 250/150 to 300/150 Build time decreased from 86 to 64 seconds Interceptor build time increased from 6 to 11 seconds Interceptor damage decreased from 5x2 to 8x1 Interceptors will get +1x1 per Air Attack upgrade instead of +1x2 For the Carrier, we want to make changes that allow players to show their skill in controlling this powerful capital ship. One of the main pain points with Carrier power is that it is very front-loaded in terms of burst damage. Currently, the Graviton Catapult upgrade allows the Carrier to deploy Interceptors to easily overwhelm the sorts of rapid-firing units that could soft counter it, like Hydralisks and Marines. This makes the interaction between Carrier groups and opponents highly lethal—either kill the Carriers quickly, or be quickly destroyed. By removing the Graviton Catapult upgrade, reducing Interceptor damage, and increasing Carrier hit points, we hope to reduce how immediately lethal Carrier encounters are for both sides. Time Warp now also reduces the attack speed of enemy units and structures by 50% in addition to slowing by 50% Time Warp has remained unchanged since the removal of the Mothership Core. Since the old Time Warp was balanced around being on an early game unit, we wanted to increase the power of this ability to make it better fitting for a high-tech unit. By reducing attack speed this reinforces the ability’s zoning potential. It can also be especially effective against entrenched enemy positions by weakening static defenses without outright killing them. Shield Battery Restore will now work on units under the effect of the Phoenix Graviton Beam This will allow Shield Batteries to be more effective against low numbers of Phoenix harass. As a result, Phoenix play will need to be more of a commitment if the opponent builds Shield Batteries. Health and Shields reduced from 450/450 to 300/300 Lowering the overall life of the Assimilator brings it more in line with Refineries and Extractors. Once Warp Gate research is complete, newly built Gateways will automatically transform into Warp Gates on completion Ideally, once Warp Gate research is done, newly built Gateways are always transformed into Warp Gates. This isn’t the most strategic or mechanics-intensive decision, so we are testing out making it automated. New countdown timer added to the start of matches played in the Testing Matchmaking queue We’ve received feedback that players would like to test the addition of a countdown timer at the beginning of matches. This could help players have a smoother transition from the loading screen to the start of a match by reducing uncertainty about when the game starts. Thus, we’ll be feeling out this change in the Testing Tab. The next War Chest is arriving soon. Check out the skin trailer we debuted at GSL vs the World. Below is a collection of all the new loot you can expect for each of the three races. The third season of the War Chest brings with it a new cosmetic item: banners. Banners are a new way to customize your look in StarCraft II, and are displayed whenever you load into a game in Versus or Co-op. Each War Chest you purchase comes with its own race-specific banner, and if you pick up all three, you’ll also receive the exclusive “random” banner for those that let fate choose their race.. Along with all these new items, the War Chest also includes a 50% boost to experience earned when playing Co-op. Unlike previous War Chests, this boost will not be limited to 30 days—it will be active for the entire duration of the War Chest event. This means you’ll have from August 9 until December 6 to level up your favorite commanders. Those who purchase the bundle will receive the “random” banner as well as the following items claimable in other Blizzard games. Player Portraits can appear blank or missing when loading a replay. Previous patch notes. It's time for another anniversary, and this time it's StarCraft 2 that's celebrating with in-game goodies! We're getting a cake profile portrait, double the co-op XP and, most importantly, fireworks and banners upon command center/nexus/hatchery completion! So happy birthday to SC2 and let's get in there and get those great rewards and harvest that XP bonus until July 30th! It’s hard to believe that it’s already been eight years since the release of Wings of Liberty. Eight years of the most amazing esports moments. Eight years of the most passionate and hardest working gamers in the world. To celebrate our anniversary, we’re giving away a yummy cake portrait to every player who plays one game during the promotion. StarCraft II demands a lot of brainpower so enjoy some sugar while earning ladder points. In-game, the workers are joining in on the celebration, but instead of wearing hats or stuffing their bodies with glitter, they will proudly fly banners and launch fireworks every time they complete a base structure. Party supply rental fees are costly in the future, however, so the signs will come down after some time. And finally, as a thank you for everyone who has continued to support StarCraft II, we’re activating a 100% bonus to the base experience gained in Co-op commanders and for leveling up individual races in Versus. Now is a great time to max out Commanders or earn levels for your off races. The celebration begins today and lasts until July 30 so don’t wait to jump in and celebrate StarCraft II’s birthday. As always, thank you for your continued passion and love for the game. Not much to say here, as this minor patch changes Kerrigan's Mutalisk upgrade and adds a bunch of bug fixes for co-op missions and versus mode. The Renegade Missile Turret now has a burning animation. Fixed an issue that sometimes caused Widow Mines using the Special Forces skin to display a slower than normal burrow animation. Removed the ‘Attack’ and ‘Stop’ commands from Pylons in the hotkeys menu. The Anion Pulse Crystals upgrade no longer shows an internal string when using the Wings of Liberty expansion level. A Widow Mine using the Mira’s Marauders skin now shows the burrow particle effect. Previous patch notes. We've already had a more in-depth preview of the new co-op map and commander changes coming with next week's patch, and today we're getting the full patch notes! In addition to the previously announced changes and additions we're getting a new Russian announcer, a few more commander tweaks, editor improvements and a new neutral structure, as well a whole lot of bug fixes. New neutral structure added: Renegade Missile Turret The RMT is hostile to all players on the map. Its location will be visible on the mini-map at all times, until destroyed Has the same stats as the Terran Missile Turret. Can be destroyed like any other building. Must be set to Player 15 in the Editor to function properly. Dev Comment: We’re adding the Renegade Missile Turret as a new tool for melee map-makers. Like Xel’naga towers, gold minerals, and destructible rocks, we’re looking forward to the creative ways this structure can be used and will be used in future map-making contests. Setting an actor’s Visibility Shape no longer causes it to disappear. Fixed an issue where items that were on sale would not show the discounted price. French – The ‘New Premium Maps’ sub-tab button is no longer cut off. Previous patch notes.